Laura Hall demonstrates proper form for student/pony. When I first came up with the idea of putting on a horse show to benefit the Alzheimer’s Association, I wanted to make it something a little different from the shows we are used to today. Something more casual and less competitive and less stressful! In the olden days (when I was a kid) a horse show was a community event. Someone’s father ran the beer tent, someone else’s father ran the in-gate and friends and neighbors got an opportunity to catch up with each other. There were no trainers ready to pounce on you when you came out of the ring to dissect every move you made in the ring. It was fun and casual and everyone left happy. If we pouted or whined about results we were quickly told that the horse could be sold and tennis or piano lessons were available! I have asked around (now that I have come up for air) what memories were created last Sunday and I LOVED the responses. I’ll start with mine. Seeing Laura Hall’s ponies come over the hill to do their job for the day brought tears to my eyes. Chalk it up to senility. Several debuts were made on Sunday. Meghan Timmerman got to see her new pony, Presley, jump for the first time with Jane MacDonald and realized she made the right decision when she bought him. Cityscape, owned by Judith Chun and Lynid Davidson, is a newcomer to Three Runs and was Reserve Champion of the open hunters piloted by John Abbot. Many jaws dropped including my own when I saw this beautiful mare. Lily McCabe rode in her first show on City Limits, whom she is leasing, and was Reserve Champion in the Childrens Hunters Walter and Angela Little partnered up for the first time in the show ring and had a blast. (Along with being very successful) Montreux- owned by Mary Marshall was reserve champion in the open hunters. It was a great time for Mary to ride along side her trainer John Abbott and get to show off her sweet horse to all of her friends and neighbors at Three Runs! All of John Abbott’s riders were very positive about having a great time at the show and I really hope they will come again. Lorri Sullivan’s high point was watching her baby Girl, Josie, ride in her first horse show and her son, Shane, move up into the walk/trot division. She reiterated again what a fun day it was. Laura Hall and I spoke the day after the show and she told me her happiest moment was when all her students were finished, ran off for ice cream and came back to watch the show together, not caring who had gotten first, third or last, but all good friends. Meghan Timmerman also confided in me at how good it made her feel to watch the parents cheering wildly for every single child. Not just their own and not just the winners. Dawn Beckering won the Captiva Island Resort Vacation in the Silent Auction for her son Steven’s honeymoon. These are only few snippets I have received and I couldn’t list every ribbon won although I would have liked to. Having spoken with a few exhibitors, I am shamelessly patting myself on the back (along with my friends who volunteered their time and energy) for putting on a special day with good riders, good horses and good people. The little things that make you smile. I am new to Second Level dressage this season. I have been studying the tests, and wondering what exactly is “travers.” How can I tell if I have the correct bend? Purpose: The purpose of the travers is to improve the engagement of the hindquarters, as well as the collection, suppleness and lateral bending of the horse. It also helps to improve the horse’s obedience to seat, leg and rein aids. Execution: The horse is slightly bent around the inside leg of the rider. The horse is looking in the direction in which he is moving. 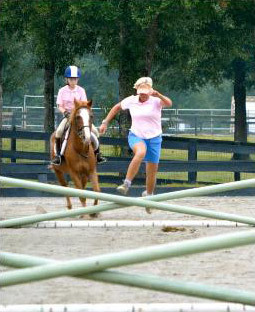 Since the travers in this test is performed down the long side of the arena, this means the horse’s head and neck should be pointed straight down the track. At the same time, his body should be at a constant angle of about 35 degrees to the inside. This is a greater angle than the shoulder-in, which is also a trotting lateral movement introduced at Second Level. The horse’s outside legs pass and cross in front of his inside legs. Appearance: From the front or from behind, an observer should see four separate tracks, one for each leg. It is important that the forehand stays on the track, and the hindquarters remain more inwards. The bend is not as confusing as you might think. Simply have the horse look down the long side as if he were travelling ahead on a straight line, while holding his haunches clearly to the inside. One example of incorrect bend is if your horse is travelling with his haunches to the inside, but he is looking outside of the arena. This would be a serious fault. Too much bend, in which your horse is looking to the inside of the arena, would also be a fault. As with all lateral movements, the gait should remain free and regular, maintained by a constant impulsion, with suppleness, cadence and balance. Horse bent to the outside. There is no clear angle, or barely enough angle. There is a loss of impulsion and energy. The horse is not reliably on the bit. The pair struggles with the movement, or lacks ease. The horse’s forehand is not on the track. The rider is too busy, or looks like he or she is trying too hard. The horse shows a clear 35 degree angle to the track, which is consistently maintained throughout the movement. The horse maintains the correct bend. The horse stays reliably on the bit. The transitions in and out of the movement are clear. The horse displays ease and fluency. The rider sits quietly, giving invisible aids. 9-10: Very Good to Excellent. There are clear transitions in and out of the travers. The movement is performed precisely from point to point. The horse easily maintains a 35 degree angle, and clearly travels on four tracks. The horse’s gait has absolute regularity. The horse is elastic and free. His poll remains the highest point. He is energetic and has clear collection. He is completely willing and in harmony with his rider. 8: Good. The movement could have more precision from point to point. The movement could be even more expressive. The horse displays no resistance and shows a good quality of trot. The angle and bend are clear and well maintained. 7: Fairly Good. The movement could have more expression. The horse could be in better collection and have more energy. The movement could have more angle or be better maintained. The movement is not executed precisely from point to point. The horse shows no obvious resistance. 6: Satisfactory. The trot needs more cadence: the horse hurries or gets too slow. The movement is not executed precisely from point to point. The angle of the horse to the track varies. The horse displays some lack of freedom, some stiffness or some tension. The horse could have more consistent correct bend, more engagement or more uphill balance. The horse could display more ease. 5: Marginal. The movement is recognizable, but lacks quality. There is not enough collection. There is not a clear angle or rhythm. The horse is tense, hollows his body or tilts his head. He is not consistently on the bit. He has limited self-carriage. 4 and below: Unsatisfactory to not executed. The movement is not recognizable as a travers. There is no clear angle. The horse displays incorrect bend. His gait is irregular and his body is too hollow or too tense. He is not engaged, not on the bit or displays too much resistance. I hope these guidelines will help you with the travers. This is one of the challenging, but rewarding moves that will help you along the path to greater harmony with your horse. It is step on the journey to the half pass (Third Level) and the canter pirouette (Fourth Level), which are movements that give you the basis for progression to FEI. Have fun with it!